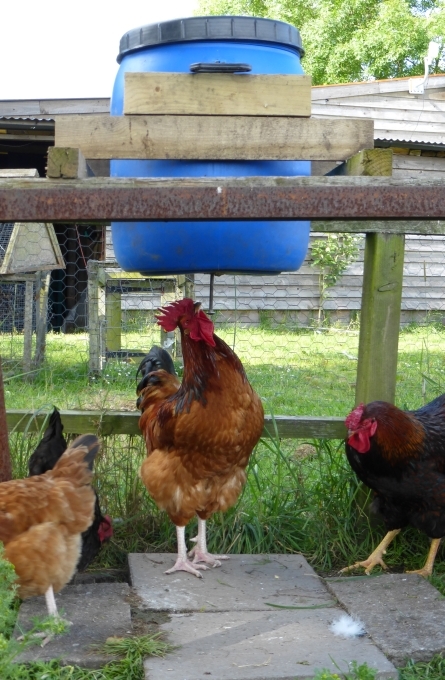 What I wanted was a feeder that only released small quantities of feed at a time, to prevent wastage and ensure there was no uneaten food hanging about to attract vermin. I remembered seeing a pheasant feeder once that had a ‘trigger’ hanging from a barrel that the birds would peck at to release feed, so that gave me this idea. I never looked to see how it worked, but perhaps it was something like this!! I needed a way to hang the trigger, so I took a 15mm copper pipe-tee and drilled a hole opposite the ‘branch’, to accept a long 6mm coach bolt. I then screwed a nut on the end of the bolt and hit the tee flat with a hammer (very satisfying) until it was held securely. I then drilled a hole in the bottom of a blue plastic barrel, dropped the trigger in and suspended the whole thing from the duck-run fence. The barrel will take a full sack of wheat, and I put some old paving slabs underneath to stop the area becoming muddy. 1) The height is critical. Too high, and the hens won’t figure it out. Too low and they won’t go under it. I found I had to start with the base of the barrel about chook head height to begin with, so that when they walked under it, they nudged the trigger with their backs and grain fell out out ‘by accident’ (they then started wandering about underneath the feeder and looking bemused when it rained grain seemingly at random!). 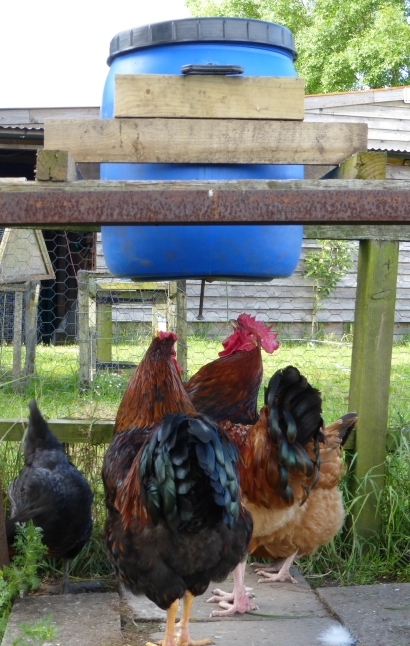 Once they’d figured out that they could peck at the trigger to get food, I gradually raised the feeder up until they had to stretch to get at it (this will hopefully keep it out of the reach of vermin). 2) The hole diameter in the barrel is very important. Start small and increase it if you need to. 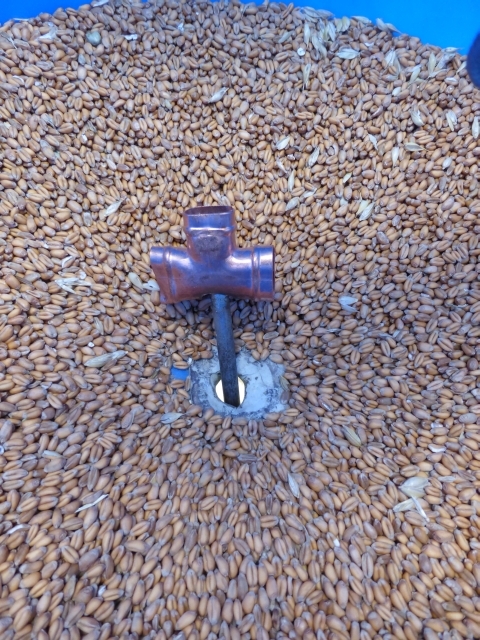 I did the opposite (oops), and had to reduce the size of the hole using epoxy putty as it was releasing too much grain at once, leading to wastage. In the end, my hole is about 10mm across, and releases only a few grains per peck so this might be a good starting point. 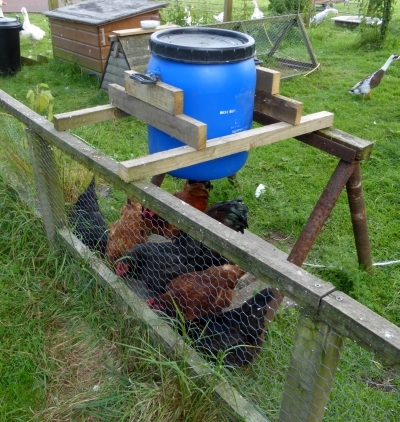 It’s very important that it’s a little bit difficult for the hens to get at the grain. If too much releases at once, they get lazy and peck away until there’s a puddle of it at their feet, which then makes a mess. If only a few grains release at once, it’s easier to eat them up each time than keep pecking at the trigger, and it then works as intended. Obviously the hole size must be adjusted for different sizes of food and different trigger diameters. 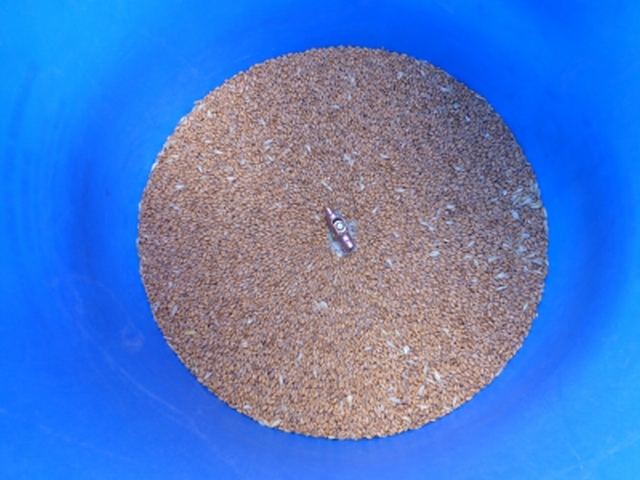 3) The barrel has to have a watertight lid otherwise rain will leak in and the grain will spoil. That’s also the reason it’s hung the way it is, as I didn’t want to drill holes in the sides to mount legs if that meant water would get in. Eventually I’ll think of a more elegant way to support it, but that will do for now! 4) It seems to help if the end of the trigger is red. I originally had a piece of red tape on the end of the trigger which eventually got pecked off. Still, it seems they’ve got it figured out by now! As ever, this design could be modified or made in all sorts of different ways (for example maybe an old fork or spoon could be used as the trigger? I see no reason why not!). By the way, if you liked this post, check out my idea for a home made chicken drinker.